where can one buy them nowadays? There are so many options on Amazon. They’re like $9.95. But they’re actually nylon. Not cotton. Look up Nato strap. All hail the cotton watch band! I have several of them in stripes and plaids. One can change them daily for longer wear. Some of mine are close to threadbare but are sentimental favourites and as they haven’t actually fallen apart, they cannot be thrown out. If you live in America, your best bet is Brooks Brothers. I have purchased a few there. Any Canadian readers can find them at Harry Rosen shops down east and independent haberdasheries across Canada, especially in Vancouver. In Victoria, British Columbia, check out ‘Simply the Best’, an excellent British shop. They have a nice selection. Most Old Money watch bands of this style are grosgrain. George H. W. Bush wore them a lot. OMGs sometimes wear grosgrain belts, too. Another address for these watch straps and belts is Eliza B, from Essex CT. Also Hodinkee. Personally, I prefer either a quality watch with leather strap, or no watch at all — like former UK PM David Cameron, who doesn’t even wear his wedding ring. I used to get these at Brooks Brothers when I was younger. They would invariably become threadbare and need to be replaced. Leather watchbands would disintegrate. It’s been metal ever since. Great call. 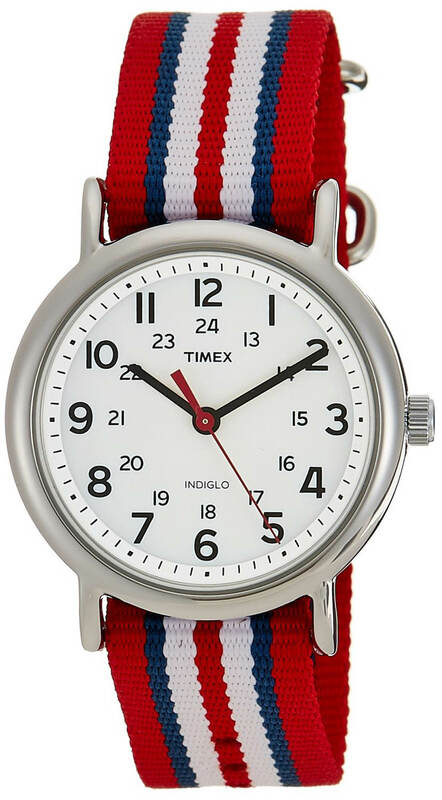 The Timex watch listed is a great watch for the weekend. Inexpensive enough to rough around without care and classy enough for style. I am partial to the Fairfield. Great Christmas gift idea for my wife I must say. Thank you. That’s right, Dario. The watch Byron is showing us here is the Timex Weekender which looks great with a grosgrain watch band. They make a slightly dressier version called the Weekender Fairfield which I prefer because it has a cleaner, simpler face. OMGs usually don’t wear elaborate, showy, “look at me” watches. They normally prefer simple, understated timepieces, sometimes expensive, sometimes not.